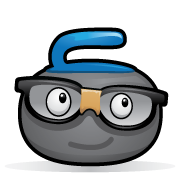 CurlingGeek is above all else a curling fan. One who got really, really frustrated trying to follow his favourite teams with just line scores. PLEASE, WHY WON'T YOU REFRESH! Ugh! All that for a blank? I figured: there has got to be a better way. Sure, in a perfect world, you could attend every game, or at least watch a TV broadcast, but that doesn't seem likely to happen for the bantam zone playdowns in Milton. Thus was born CurlingGeek. My very first real broadcast was a midnight tie-breaker between Wayne Middaugh and Wayne Tuck at the 2008 Ontario Tankard. The site was pretty rough back then, but the fans made it clear: they wanted to know where the rocks were landing, and they wanted to talk to each other. Not as awesome as having Russ Howard doodle amazing shots on TSN, but so-much-better than line scores, and a lot easier to set up than a webstream. So now I've made this site, and I want everyone to use it...so I'm keeping it free. Sure, I'll probably stick some ads up at some point to help cover the costs, but to be honest I'm under no illusions about making millions from a curling website. 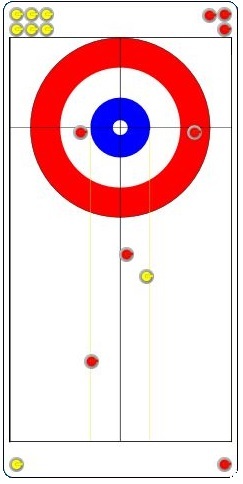 I just want to give back to the sport I love, and I really, really, want to know who's sitting shot in the 7th end of those bantam zone playdowns. If you love the site, and want to support me in my efforts, then become a broadcaster. It's free, it's easy, and there's no software to install. Internet trolls were an early problem for the site, so I've got a natural dislike of people who hide behind a fake name on the internet. So I don't. CurlingGeek is a cute character, and I hope you like him, but if you want to spoil the mystery, go ahead and click here.